I love Mexican food, I love it a lot. My kids love Mexican food also. My husband thinks he doesn't like it, but he does, as when I make it, he enjoys it. Friday night is my husbands pub night with his mates, so it is only me and the kids at home for dinner. So when I'm deciding what to cook for dinner, it is food I know they will love. I found this recipe in the current issue of Super Food Ideas and I just had to try it. This is so easy to make and quite cheap to make. The flavours are amazing. The tortillas transform into a sort of 'pasta' feel, they are so good, I can't believe they taste the way they do. And the salsa, OMG, this salsa is delicious. Honestly I could eat the whole bowl of salsa myself. Now my baking dish was slightly larger than the one stated below, so I only got three layers and it worked perfectly fine. If your dish is larger, just place 1/3 of the mince mixture and bean mixture on each layer. 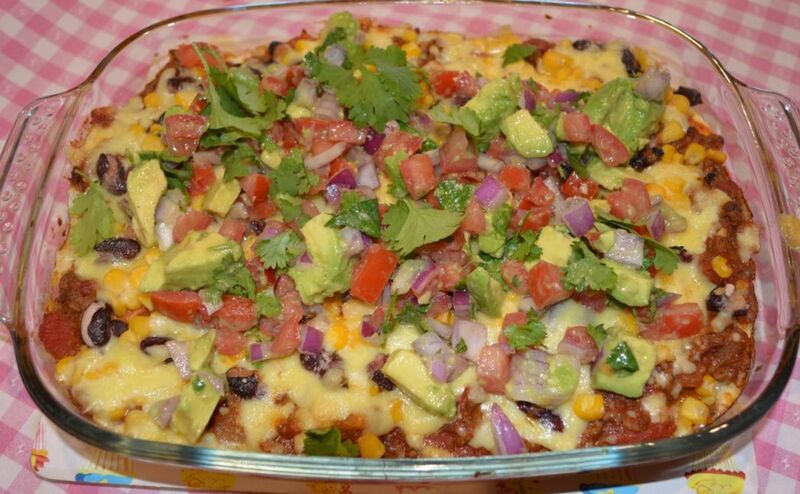 Anyway this is such a great dish to make if you are on a budget, need a quick dinner idea and you love Mexican flavours. We love it, hope you do to. Preheat oven to 200C/180C fan forced. Heat oil in a large frying pan over medium-high heat. Add onion, sauté, stirring regularly, for 5 minutes or until softened. Add garlic, sauté for 1 minute. Now add the mince, cook, stirring, breaking up the lumps with a wooden spoon, for 6-8 minutes or until browned. Add the chilli powder and cumin, stir it through for 30 seconds, then add the tinned tomatoes. Season with salt and pepper, stir it through. Bring to the boil, reduce heat and simmer, uncovered, for 20 minutes. 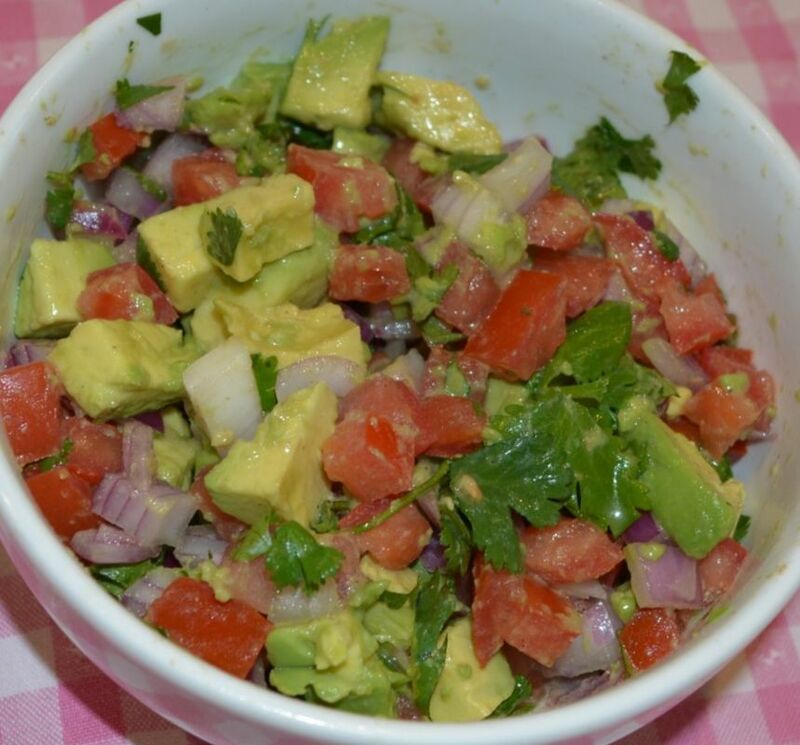 While the mince is cooking, make the salsa: Combine the avocado, coriander, onion, tomatoes and lime juice in a ceramic or glass bowl. Season with salt and white pepper. Stir carefully to combine. Cover with cling film, refrigerate until needed. Reserve 1 cup of the cheese. 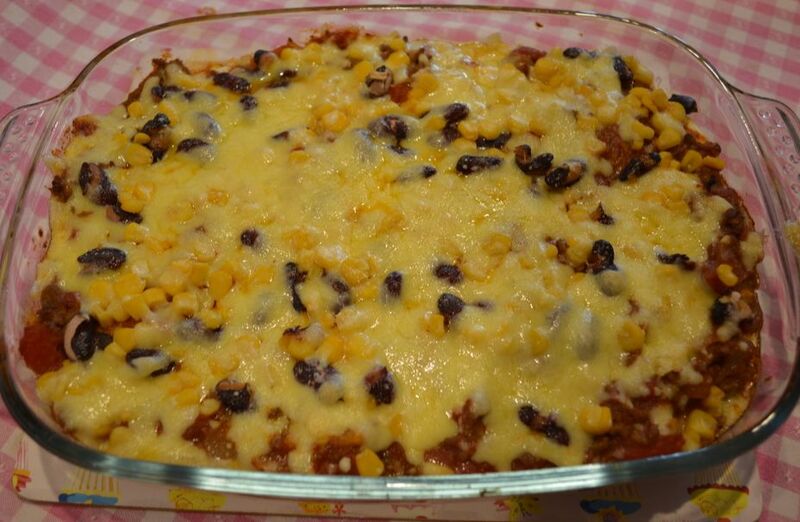 Combine the remaining 1 cup of cheese with the red kidney beans and corn in a bowl, mix to combine. Now to assemble the dish. Spoon 1 cup of the mince mixture into the base of a 4cm deep, 18cm x 21cm base, 8 cup capacity baking dish. Sprinkle with 3/4 cup of the bean mixture. Top with 4 pieces of tortilla to cover. Continue layering with 1 cup of the mince mixture, 3/4 cup bean mixture and 4 tortillas to cover, you need to finish with a layer of bean mixture. Sprinkle on the reserved 1 cup of cheese. Bake for 20 minutes or until the cheese has melted and is golden. Stand for 10 minutes before serving. Top with the salsa and serve with lime wedges.